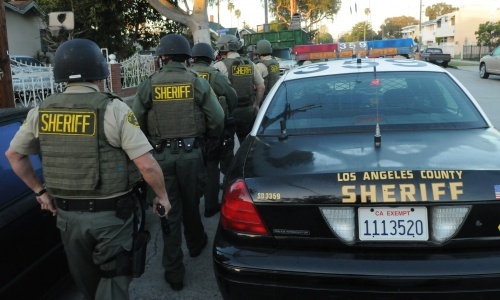 A violent robber was nabbed by officials from the LASD West Hollywood station on Tuesday, May 17. WEST HOLLYWOOD—Deputies from the Los Angeles Sheriff’s Department and Beverly Hills police officers caught one of three robbers who were involved in robbing two people on a street in West Hollywood on Monday, May 16. The suspect was captured on Tuesday, May 17 in a search that involved sheriff’s deputies on the ground, police dogs and a helicopter crew, the sheriff’s department reported. According to Lt. Vance Duffy, Watch Commander at the LASD West Hollywood Station, the robbery occurred around 9:30 p.m. Monday near the intersection of Sunset Boulevard and Hilldale Avenue where two of the suspects robbed two people who were walking. Both suspects depicted handguns to the victims. The search was originally conducted on Melrose Avenue, between San Vicente and La Cienega Boulevards. The personnel desk transmitted the information over the Sheriff’s radio to advise the field units to ensure an expedited response to the area. Residents were advised by authorities to stay inside their homes until the search operation was over. According to Duffy, one of the victims was pistol-whipped. The victim’s condition is unknown. After the attack, the three suspects fled into an area around Melrose Avenue, between San Vicente and La Cienega boulevards, according to the sheriff’s department. “We set up a containment, brought in K-9 units and an airship and then began a ground search of the area,” Duffy said Tuesday morning. “We caught one of the men but the other two are still outstanding.” The suspect whose name and identity has not yet been released to the public was taken into custody shortly after midnight, noted the LASD West Hollywood Twitter page. The search continued for the second suspect for a short while. After the search of the area was finished, authorities deemed the neighborhood safe and residents were able to return to their home, noted Captain Holly Perez on the department’s Facebook page. Detectives are actively continuing their investigation to locate all other parties involved. The suspect was booked on charges Tuesday morning. Anyone with information on their whereabouts are asked to contact the LASD West Hollywood Station at (310) 855-8850.